The overround is the inbuilt profit in a betting market. In a fair market all odds would add up to 100%. If the book is over 100% then layers make a profit, below 100% and backers make a profit. Imagine a coin toss. The odds of a head or a tail is evens (2.0 decimal) so fair odds for either outcome would be 2.0 decimal. However, there would be no profit for a bookmaker so the bookmaker would initially offer slightly less than evens for both outcomes and then alter the odds depending on the weight of money bet on each possible outcome. The overround for any market (assuming decimal odds) is the sum of the reciprocals of all the odds to back. In the picture below we see a typical market on Betfair. To the left of the word "Back" we see 102.9%. This tells us that the market is overround to back and backing the whole field would lose us 2.9% of our wealth, over time. If we look across to the value next to lay, we see 99.6%. 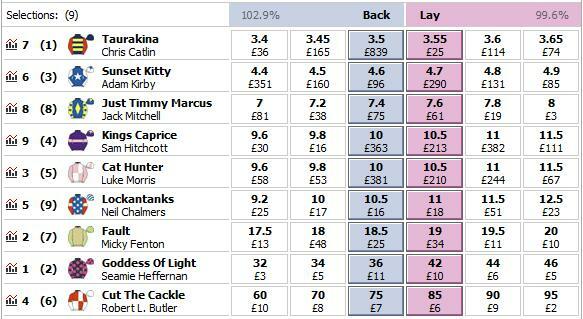 This is what the bettors would like to back the selections for an underround (also known as overbroke) book. 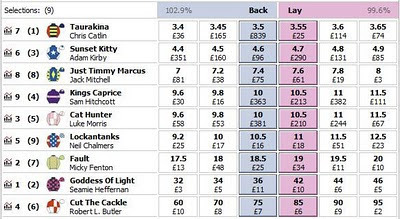 Being lucky enough to be laid at all the odds in the pink we could make a profit of 0.4% over time. Occasionally the "Back" column is momentarily underround and for a fleeting moment offers the suitably equipped arbitrageur a guaranteed profit.